Hughes & Kettner just seems to be getting better with each new product they release and all things considered, the Switchblade has to be the best amp we've come across in quite a while. Great tone. Decent effects. Amazing price. Shame the modulation effects couldn't be a tad more controllable. After a splurge of technological advances over the past decade that have seen amps and multi-effects units marrying authentic valve-like tones with complex operating systems, there has been a movement back to the simpler times of one amp, one cab, one lead and one guitar. Of course, things can't be un-invented, and if any player has spent time with, for example, a Line 6 Vetta, it's very difficult to go back to tap dancing on a number of stompboxes, A/B switches and channel changers in order to obtain a number of sounds quickly. 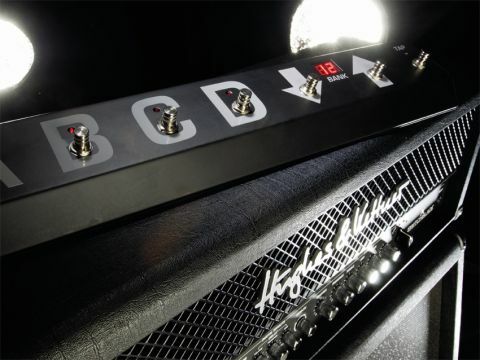 In the midst of a constant barrage of increasingly affordable yet technologically advanced solid-state amps comes the Switchblade, the music world's very first programmable all-valve 100-watt head loaded with user-friendly digital effects. In fact, there's a lot more under the bonnet than a brace of tubes and some scratchy, over-thin modulation effects you'd never use. This is the real deal - an amp that's fully loaded with four distinct channels and a choice of digital effects, including chorus, reverb, delay, ﬂanger and tremolo. The reverb is controlled by a dedicated pot, while the delay is regulated by no less than three controls that look after time, feedback and level. The Mod-FX pot accesses one of the three modulation controls at one time, the rate of each changing through the specific three thirds of the pot's revolution, with depth altered automatically yet musically. Still not convinced? Then consider this: the amp comes with H&K's FSM 432 MIDI board that, thanks to the Switchblade's MIDI compatibility, allows you to save 128 sounds, comprising a combination of any of the four channels with effects settings. These can be instantly recalled via 32 banks of four. Storing a sound is a little confusing initially, but once you've got the hang of it, as is often the case when guitarists and MIDI meet, it seems obvious: get your tone and press the Store button on the front panel. Once it lights up, select a patch on the MIDI board and when the display ﬂashes, press store for a second time. When the LED goes out, the sound is 'learned'. It's also possible to change a whole line of MIDI-compatible devices via the board, and even switch the amp's effects in and out in Direct (or Manual) mode: there's even a Tap function for perfect delay time settings, automatically overwriting the previously set delay time. Any technophobes who will have been on the point of dismissing the Switchblade after that mere mention of MIDI should be assured that with the effects stripped away, this is a wholly professional amp with a quartet of channels - clean, crunch, lead and ultra - that can be selected by a four-way rotary knob. Obtaining any sort of specific sound does depend on choosing the correct channel, but the fact that the controls are shared between the four does make things simpler. Although it would be fair to assume that each channel, in terms of gain at least, picks up where the preceding one left off, that's not strictly the case, as each is voiced very differently too. As a basic example, the Lead channel is voiced to give the classic British-style overdriven rock tone (think classic Iron Maiden rather than Led Zep, though), while the Ultra option gives that huge and saturated bass-heavy scooped gain sound. However, this is putting things too simply - as we'll discover, this is a very versatile amp indeed. To add to this adaptability, there's a mono FX loop to be thrown into the pot, the status of which - in or out - can be stored along with the remainder of the amp's settings. So, if you have a specific effects box you just can't do without, run it into the FX loop either in series or parallel, have the unit on all the time and allow the amp to choose it for you - at your behest, of course. The only control that isn't programmable is the master volume, which does allow you to tailor the output to the venues in which you play. Of course, this may colour your carefully crafted tones if you go from the Dog and Duck to Earls Court in a single tour, but with 128 patches, you can always squirrel away some substitute tones with different EQ, just in case. The cabinet we used for this review is H&K's VC412A30 4 x 12, loaded with a quartet of Celestion Vintage 30 speakers. It retails for £610. You can opt for a cab of exactly the same spec, aside from the provision of four Celestion Greenback 25s, for no change in price. Alternatively, and in the spirit of providing all relevant information, you can go for the Switchblade combos, which are loaded with Eminence Rockdriver 60 12-inchers. We're not going to get into the eternal 'solid-state versus valve' debate here because in recent years, the tonal comparisons have become just too close to call. However, spending even just a few minutes with the Switchblade, you start to understand that pressing a single button in order to obtain a great tone is a luxury you wonder how you ever managed to survive without. It's difficult to know where to start describing the basic performance, other than to say that any gigging semi-pro or pro guitarist will be blown away by what this amp can do. It can produce everything from a clean tone sprinkled with a classy chorus good enough to rival that of a JC120, to a crushing Metallica rhythm sound that Mesa's Randall Smith would probably applaud. We actually had fun trying to come up with combinations of styles that might fox the Switchblade, but a disco AC/DC covers band, gospel Bolt Thrower tribute or even 'Slayer Pops' failed to raise a metaphorical sweat. Seriously though, each of the four channels sounds wonderful and the modulation effects are certainly of a high enough quality for you to consider replacing those trusted BOSS stompers, without too much tonal compromise. The on-board effects aren't as controllable as dedicated effects units, of course, but that has to be our only niggle here: the reverb and delay are both truly excellent and that'll do us nicely. The lovely warm, clean tone and subtle crunch tones benefit most richly from the complement of valves. Also, as we've stated many times before, the indulgence of being able to step on a button and have the same sound but louder for audible solos never fails to make us grin like loons. The final gold star the amp receives is for the asking price of £999. Even though this doesn't include a dedicated cabinet, the quality of the tones and straightforward nature of the operating system make the Switchblade head something of a snip, and of course that's before you go price hunting on the street or online. We fully understand that playing though a quality all-valve amp is a wonderful experience, especially if you can do it regularly, and as soon as the phrase 'on-board digital effects' is whispered, the perception is that all the warm gooey nature of valve overdrive is negated at a stroke. There's no such problem with the Switchblade, which is an amp that mixes old-school valve prejudice with the open-endedness that modern technology provides, without any tonal compromise whatsoever.